Not your traditional Basil Pesto recipe but equally as tasty. The ramps give this pesto a slightly spicy taste which goes very well with toasted pine nuts and asiago cheese. Because of the slight onion and garlicky taste to the ramps, there is no need to add garlic to the recipe. Just think of all the dishes you can add this ramp presto too. Remember those beautiful ramps that David of Earthy Delights sent us? The bundle was so lush that I did not want to waste the greens, so I blended them with some olive oil and tucked away into the freezer for a rainy day. We did not need a rainy day to make a batch of Pesto, for our Soup au Pistou, so I took out one of the packages and created a fantastic pesto using toasted pine nuts and asiago cheese. 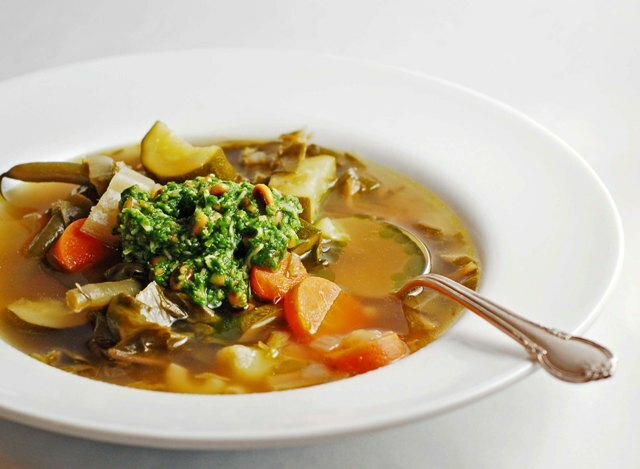 It was a wonderful addition to our soup; slightly spicy, nutty and a little bit garlicky. A completed recipe for the Pesto, if you want just the base click here. Toast the pine nuts in a small frying pan on top of the stove over low heat. I continually shake the pan as not to burn the nuts. Add ramps, pine nuts, and cheese to a food processor and pulse just until blended. 4 Responses to "Ramp Pesto"
It's gorgeous! But then again, so is everything you make. I need to branch out and start trying pesto made with different things. Basil is fantastic, but there's so much variety out there.